I'm traveling to Wisconsin to visit family over the new year and, in traditional Wisconsin spirit, hope to bring back lots of cheese. Given that the TSA's guidelines can be quite insane, I wanted to be sure that my yellow treasure would make it home. 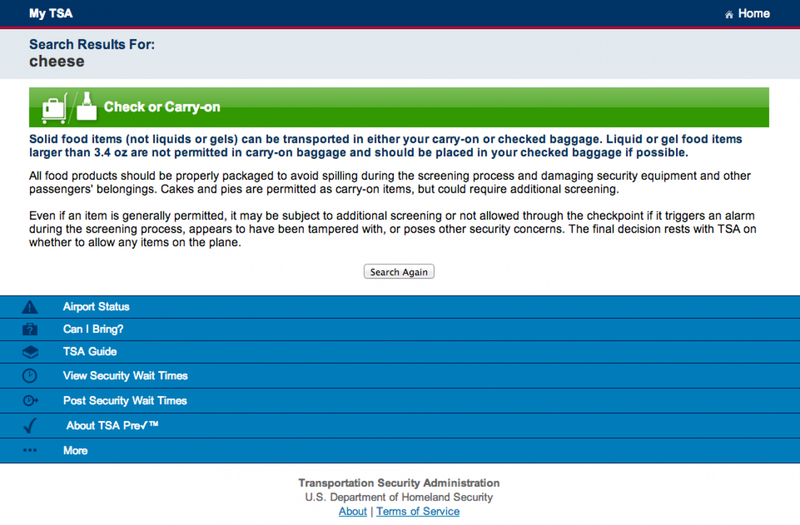 The TSA has put together a pretty massive database of items that you can bring through an airport security checkpoint. You can access the tool by clicking here. Enter a search term and a list of items from their database will populate. Select the one you're interested in and click Search. You will be taken to a pretty generic results page; my search for "cheese" brought me to a generic "food" page, where I learned that large quantities of solid foods are permitted. So, as long as I stay away from cream cheese, I should be fine. Remember that it is always at the discretion of the TSA employee inspecting your luggage; avoid carrying things of great value that you think might get rejected as you normally will not be allowed to leave the security checkpoint to find alternate means of transporting the item. For example, I once mistakingly left a valuable pocket knife in my carryon after a camping trip and I was not allowed to leave the security checkpoint to mail it home after it was confiscated.